The following analysis is from Volume 3, Issue 6 of the Peace Science Digest Citation: Ramsbotham, O. & Schiff, A. 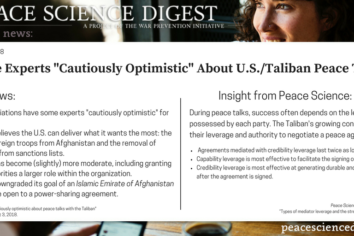 The pending negotiations between the U.S. and Taliban have some experts “cautiously optimistic”. 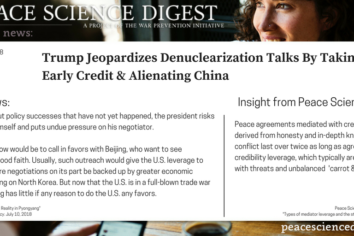 Peace Science shows us that successful peace talks often depend on the type of leverage possessed by each party. 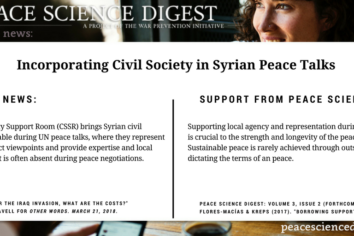 Syrian civil society has become better organized and more tightly interconnected, providing a valuable resource to UN negotiators and others working towards peace. The Civil Society Support Room (CSSR) is helping to bring civil society activists together so that their local knowledge and expertise can be better incorporated into the peace talks.